Identification of a carbon monoxide-binding pigment in liver microsomes as a hemoprotein by T. Omura and R. Sato in 1962 opened a new research field “Cytochrome P450”. 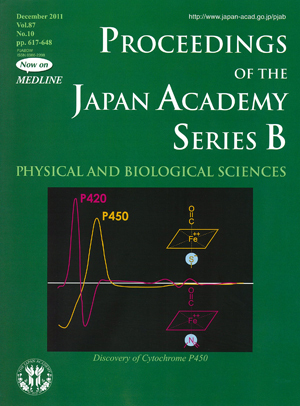 The cover illustration is taken from the review article “Recollection of the early years of the research on cytochrome P450” by T. Omura in this issue. *) It shows the carbon monoxide difference spectrum of liver microsomes (P450) and that of solubilized microsomes (P420), and the latter is clearly a spectrum of a hemoprotein. The conversion to P420 was a strong evidence for the hemoprotein nature of the original microsomal carbon monoxide-binding pigment P450. The big shift of the Soret peaks of the carbon monoxide compounds from 450 nm to 420 nm was an unprecedented phenomenon, which was later explained by the change of the 5th ligand of the heme from a thiolate anion of cysteine to an imidazole of histidine. The characterization of cytochrome P450 was followed by the finding of its monooxygenase activity by R. W. Estabrook, D. Y. Cooper, and O. Rosenthal in 1963. As the participation of P450 in various important metabolic activities in animal tissues including the biosynthesis of steroid hormones and the metabolism of drugs was elucidated in the following years, the research on cytochrome P450 has developed into a big research field in biological and medical sciences. *) Original figure, appeared in Fig. 8 in Omura, T. and Sato, R. (1964) J. Biol. Chem. 239, 2370-2378, was modified.